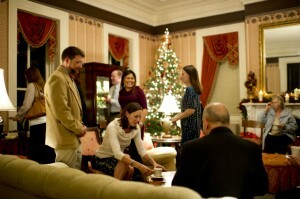 Blog Holiday Cheer Charleston Style! 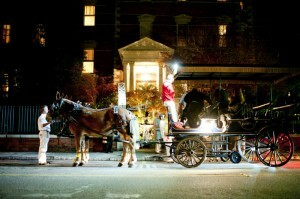 I have borrowed this post from CharmingInns.com because I think this is such a wonderful promotional idea for getting in the Christmas spirit in historic Charleston. For those of us who live here year round, we don’t have the occasion to darken the doors of Charleston’s lovely Inns and B&Bs. Here is a great way to check out Christmas decor, beautiful historic architecture and great food! We invite you to take a festive journey through the city of Charleston this December. It’s not the Polar Express, but it’s close. 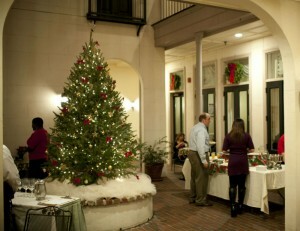 It’s Charming Inns’ 27th Annual Progressive Holiday Dinner. 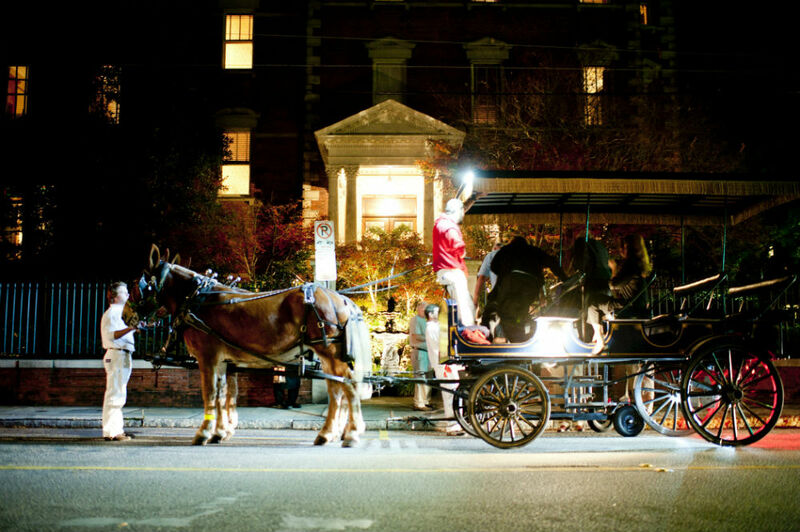 An evening when diners travel to three different downtown locations by horse drawn carriage for traditional holiday fixings and merrymaking. Our Progressive Dinner begins on November 30th and runs nightly (with exception of Sunday) through December 21st. Here’s a sneak peek inside a night of progressive dining- menu, photos and all. The illuminated streets of downtown Charleston are your guide to Circa 1886 Restaurant, set in the gardens of the luxurious Wentworth Mansion. Executive Chef Marc Collins has created a three-course prix fixe menu for you. Start with Split Pea Soup and segue to an Arugula Salad before delighting in the main course. Choose from Strip Steak with Sour Cream Whipped Potatoes and Fennel Glazed Carrots in a Blood Orange Demi Glace or a classic Shrimp n’ Grits, served with local Carolina Shrimp, an Anson Mills Grits Cake and Tasso Ham in a Chardonnay Butter Sauce. Saving room for dessert shouldn’t even be a question. After dinner, you’ll descend on historic Broad Street, lined with glimmering Palmetto trees and home to our John Rutledge House Inn. In the historic bed and breakfast’s grand ballroom, a spread of Petite Fours and cookies await. Our Pastry Chef Scott Lovorn’s signature holiday treats are back again as well: Peppermint Pluff Mud Bites and Bourbon & Maple Pecan Pie. A sweet finale to a wonderful evening. Stop 4: Head on home, visions of sugar plums dancing in your head – or stay with us! 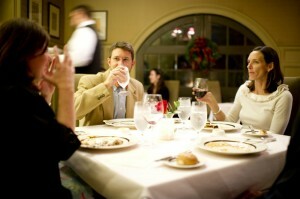 Experience the John Rutledge House Inn Progressive Dinner Package. You’ll be treated to two seats at Progressive Dinner, a rickshaw ride to your first stop at Kings Courtyard Inn, a Junior League of Charleston Party Receipts Cookbook and cozy overnight accommodations for two at a grand downtown inn. Get more details and book your stay here. You can also reserve a room overnight at any of our other three inns. Take a look here. Start a new holiday tradition! Reserve a seat at the table. Progressive Dinner makes for a wonderfully memorable holiday evening in downtown Charleston. Tickets are $95 a person. Some evenings have already sold out! Call us at 843-853-7828 to reserve a seat or visit the Circa 1886 website for a full menu and details. This entry was posted in Charming Inns, Circa 1886 Restaurant, Fulton Lane Inn, John Rutledge House, Kings Courtyard Inn, Wentworth Mansion. Bookmark the permalink.